High Dynamic Range (HDR) video aims to meet or exceed the in-scene contrast range sensitivity of human vision. When combined with wide color gamut (WCG) to achieve full color volume, HDR delivers more realistic, true-to-life video. The parameters for HDR include a minimum 10-bit signal, most often accompanied by metadata so a display knows what to do with it. The implications of video resolution, frame rates, chroma subsampling, whether it is compressed or uncompressed, can all challenge the bandwidth and compatibility of the AV system and its connectivity. 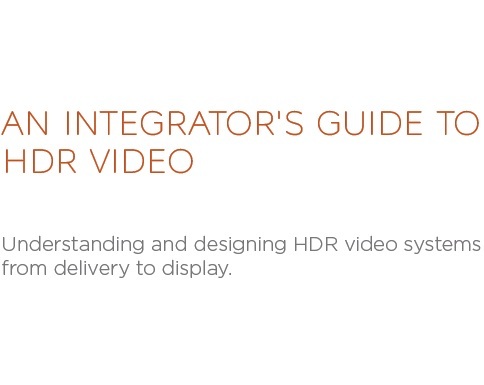 This paper explores the fundamentals of HDR video and how it relates to human vision, and underlines HDR standards, formats and connectivity to ensure compatible system design and integration.